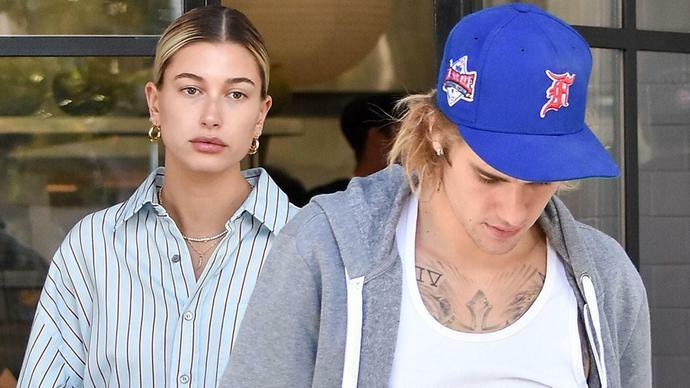 Hailey Baldwin Wears Bold Shirt Dress Look for Breakfast With Justin Bieber: Pics! Hailey Baldwin is trying out some interesting fashion as part of her newlywed life! The 21-year-old model was spotted with her new hubby, Justin Bieber, grabbing breakfast in Los Angeles, California, on Thursday. Baldwin opted for a light blue oversized men's shirt for the outing. Leaving her pants at home, Baldwin had her legs on full display! She paired the shirt with black and yellow combat boots, gold hoop earrings, multiple necklaces, a black bag and mauve lipstick. For his part, 24-year-old Bieber donned a grey sweatsuit with a white tank top and blue baseball cap. The pants-less outgoing came a day after the couple looked somber leaving a church service in Beverly Hills, California. Earlier this week, a source confirmed to ET that Bieber and Baldwin got married last month. "The couple kept their marriage a secret from a lot of people," the source revealed following TMZ's initial report. "Justin and Hailey wanted to be married, and didn't want to wait. They still plan to have a more formal wedding, but for them this intimate ceremony was exactly what they wanted." "Justin and Hailey were telling people they weren't married when they were," the source continued, before adding there are still plans for a wedding ceremony outside of the courthouse. At first Baldwin denied rumors that she had already "I do" -- she later deleted her own tweet that denied the nuptials -- but fans got their own confirmation of her marital status when Bieber referred to her as his "wife" while at a Canadian museum.